The IBTA‘s InfiniBand™ roadmap is continuously developed as a collaborative effort from the various IBTA working groups. Members of the IBTA working groups include leading enterprise IT vendors who are actively contributing to the advancement of InfiniBand. 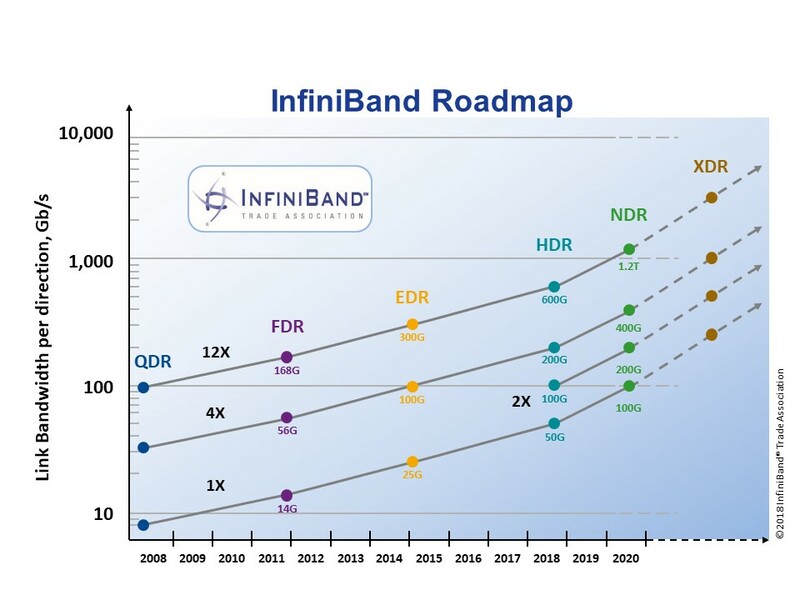 The InfiniBand roadmap details 1x, 2x, 4x, and 12x port widths with bandwidths reaching 600Gb/s data rate HDR in the middle of 2018 and 1.2Tb/s data rate NDR in 2020. The roadmap is intended to keep the rate of InfiniBand performance increase in line with systems-level performance gains. For those with a stake in the interconnect business, the roadmap provides a vendor-neutral outline for the progression of InfiniBand so that they may plan their product development accordingly. For enterprise and high-performance computing end users, the roadmap provides specific milestones around expected improvements to ensure their InfiniBand investment is protected.